Kelly Havner was born with no fingers or thumb on her right hand. Her mother, Marilyn Havner, had taken Bendectin, an anti-nausea medication when she was pregnant with Kelly and believed that taking the drug caused her daughter’s limb reduction. Kelly’s parents filed a product liability lawsuit against Merrell Dow Pharmaceuticals, Inc. alleging the drug maker’s negligence, defective design and defective marketing or the failure to warn consumers of possible dangers in using their product. According to court documents, the trial was bifurcated with one part considering liability and compensatory damages and the other considering any evidence on punitive damages. The same 12-person jury sat for both phases of the trial. Court documents report that ten jurors assessed liability and actual damages in the first phase of the trial. In the second phase, a different ten jurors found Merrell grossly negligent and assessed punitive damages. The jury awarded the Havners $3.75 in compensatory damages and $30 million in punitive damages. Merrell moved to have the jury’s verdicts set aside and requested a new trial. The judge denied those motions. However, the trial court reduced the punitive damage award to four times the compensation award in accordance with Texas law and entered judgement in favor of the Havners. An article in the September 2014 edition of the Justice System Journal, Jury Deliberation in a Complex Case: Havner v. Merrell Dow Pharmaceuticals, considers the debate about the ability of jurors to decide complex cases fairly using the Havner case as an example. The article abstract discusses how the presentation of scientific data can make it challenging for jurors to understand and assess the information in order to come to a decision. Attorney Barry J. Nace was counsel in Daubert v. Merrell Dow Pharmaceuticals, Inc., which went to the Supreme Court of the United States. This drug liability case was about two boys named Daubert and Schuller who were born with birth defects that they attributed to their mothers having taken Bendectin when they were pregnant. The US Supreme Court’s ruling in Daubert (agreed to by seven members of the Court) created what is now referred to as the Daubert standard, which is a rule of evidence pertaining to the admissibility of expert witness testimony in federal court cases. The Daubert standard establishes the judge as gatekeeper to expert testimony and established the requirements that the expert testimony must meet. When you or someone you care about is suffering from adverse effects from having taken a defective prescription drug, you need the strong advocacy of a skilled Washington DC drug liability attorney to protect your right to fair compensation. 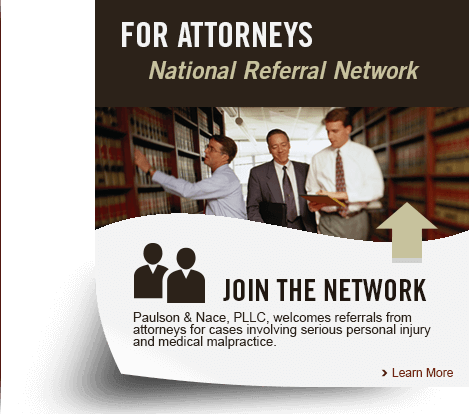 You are encouraged to contact Paulson & Nace, PLLC, by calling 202-930-0292 or completing our contact form. We represent the injured throughout Washington, DC and West Virginia.